We just can't seem to get enough chainmaille! 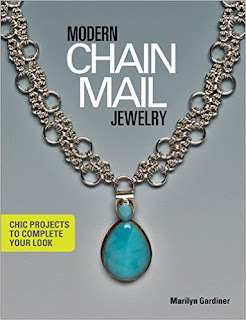 Now there is this new offering from Kalmbach, Modern Chain Mail Jewelry written by Marilyn Gardiner for chainmaille enthusiasts. The organization of this book is a bit different from most. After a brief introduction to tools, materials, and basic techniques, Marilyn showcases 21 beautiful projects that utilize a variety of woven components. These components, a total of 18, follow the projects and appear in their own section. Though this may seem cumbersome at first, I believe it gives the book real lasting value as a reference for the future. It's much easier to locate the motif you with to make for your own creative work when it is not buried in the midst of the instructions for a specific project. Though the projects are all necklaces, many have suggestions and challenges to make bracelets and earrings from matching motifs. The book is not a beginner text and the projects are somewhat complex, but there are such clear instructions and photos that you should be able to do it if you take your time and learn as you go!